Life whirls by fast, like a marvelous dance. Then the music stops and you’re dancing alone. Some couples twirl for many decades. They marry in their 20’s. Their family grows with the arrival of babies. Those babies grow to school age, then graduate from college. Suddenly your babies have babies of their own. The couple still holds hands and smiles. They still stand and sway when music plays. Inside they feel the same. Outside their hair is silver. They move a l’il slow, but get there. Other couples have the music stop abruptly. It’s the last thing they expect. They spent a l’il over two decades together. That’s all ‘twas meant to be. as his body was laid to rest. They won’t be dancing at their children’s weddings. He’ll be watching from Heaven instead. Life still whirls by at a breakneck pace. Yet, your pace is set on savor. Home feels good, like a cozy cocoon. You venture out when necessary. You pause and marvel at the sunrise. You lift your face to feel the noonday sun. You watch the moon wax then wane, and feel a tug. Family and friends cross your doorstep. Giving and receiving hugs for hello and goodbye. Laughter returns, as joy bubbles from within. I wish I could tag this “creative writing,” but it is a true story. Mine. After a two year and three month cancer fight, my husband died in August of this year. He had just turned 43. I was still 41. Now I’m 42. We were together over 21 years, counting from our first date. Together nearly half my life, married for 16. I didn’t want to write this poem, but when the words are there you learn to honor them and let them flow. Even when they make you cry crocodile tears that fall as you do. Perhaps this is why my dog was awake extra early today. Coffee and breakfast are next for me while my boys sleep a l’il longer and I can soak up the quiet of the house before chaos and commotion reign again. Zany. Crazy. Wild. Ornery. Rambunctious. Loud. LIFE! It is for living. Thank you, Lord, for the gift of today. P.S. Nearly included this line, “Not quite four months ago, and it’s still hard to believe.” Adding it here as a footnote for now, to mull over later. It’s time to make that coffee, turn on music with the volume low, sing along and sway. Happy 1st Birthday, Turquoise Tangles! Sometimes Hope comes wrapped in tan and black fur, with floppy ears, a big lolling tongue, a long wagging tail and the name, Blue. We bought our first dog yesterday. A 14 week old German Shepherd puppy. My husband has wanted a German Shepherd since before we were married. That’s been over 14 1/2 years ago now. We needed something happy and hopeful. He helps us look past May, when the chemo treatments end. He helps us think about the day that my husband is done with all these doctors and surgeries and make plans for a cancer free future. We just knew he was our dog. From a google search my husband did on Monday, and the pictures of him playing with a kitten that were e-mailed to us later that day. A brief talk with the breeder on Tuesday to set up the appointment to meet him on Saturday. Thankful for a second call on Friday, before someone else came to meet him Friday afternoon. Gave us a chance to put a deposit down, to say aloud and with certainty, he’s going to be our dog. A visit with my parents, grandfather and cousins on Friday night and Saturday morning in Southern Illinois. Then on to meet our dog and bring him home. Oh, how we love him. He fits into our family just right. Keeping us all more on the go, more unplugged and more together, than we’ve been of late. My husband is talking about renaming him. The boys and I agree though, that Blue is just right too. Thank you for sharing our happy news. 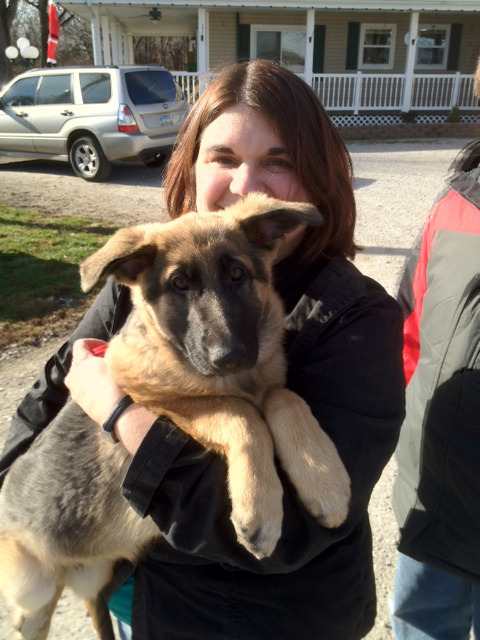 We are kicking off 2012 with Hope, and will be busy loving and chasing and training our new dog, Blue. Thank you for your continued prayers, as my husband gets hooked up to his third round of chemo on Tuesday. Unhooked on Thursday, which is when the nausea usually hits the hardest. We’ll keep in touch…and share puppy pictures too. Oh, he’s super great and wonderful and pretty as can be, handsome actually, as he’s a boy dog. The girls are getting more outnumbered all the time. One mom and one girl cat, who is Not Amused. One dad, two sons and one boy dog, our newest addition. P.S. We are so keeping his name…if I get to add any weight to my vote at all…and because I’m trouble enough to try to get you on my side to keep it as is. Happy Sunday! We’ve played all morning with our puppy and he’s sleeping in his kennel with the door open, in time for us to go to church in about 30 minutes. We’re going with a smile, always. But today’s is a little brighter, due to Puppy Love. NOTE: I originally posted this on Sunday, January 8, 2012, the day after we brought Blue home, on my husband’s Caring Bridge page. I’m posting it here today to explain where I’ve been and what I’ve been doing instead of Tumblr-ing. I’m A Dog Mom now. A Puppy Mom to be specific. We’re going for walks, playing with his rope toy AND doing the things that need done to take care of my family and household. Still figuring out how to do all that and write too…hoping to figure it out SOON. That’s as far as I’ve gotten. In the Passages to Womanhood.